Napa cabbages, more popularly known as chinese cabbages have sweet, crunchy, and celery-flavored leaves. With just 16 calories in 100gms of fresh leaves, Napa cabbage is incredibly low in calories. As it requires more calories to digest it than the amount of calories it contains, it easily fits into the neo-class of zero calorie or negative calorie group of vegetables. Though the ingredient list seems rather long, this is a simple and easy to toss together recipe. You can make the salad a few hours ahead of time and refrigerate it. Toss in the crispy noodles just before serving. Put the soy sauce, vinegar, water, sesame oil, and brown sugar in a small pot over low heat. Heat, stirring, just until the sugar has fully dissolved. Whisk in the olive oil and set aside to cool. I prefer to substitute the corn oil with olive oil. Flavour the chicken breast with spices of your choices before grilling or baking it. Rub in a dash of fresh lemon juice before shredding it for a more delicious flavour. Toss together all the main salad ingredients. Shake well and pour over the salad when it is ready to serve. That does look like a long list of ingredients, but this salad just takes 15 minutes to put together. 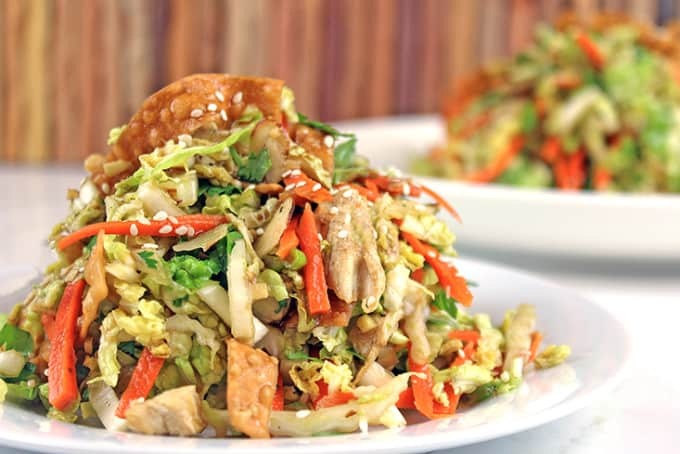 Crunchy napa cabbage, grilled chicken, crispy wontons, toasted almond and sesame seeds – sounds delicious indeed! You can substitute the canola oil with any other oil you want, like olive oil or even coconut oil. Adjust the sugar to your taste or you can add some other sugar substitute like honey. Mix sliced cabbage and green onions in a large bowl. Combine dressing ingredients in a jar with a tight lid and shake well to mix. Pour dressing over cabbage mixture, toss to coat and set aside. In a large frying pan, melt butter and stir in olive oil. Saute until noodles and nuts are lightly golden brown. 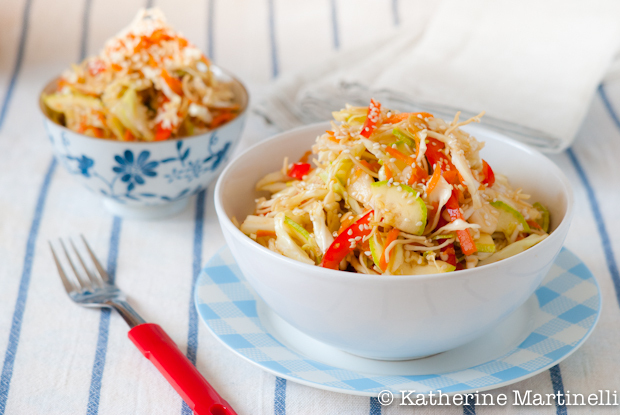 Sprinkle crunchy noodles and almonds over the cabbage mixture. 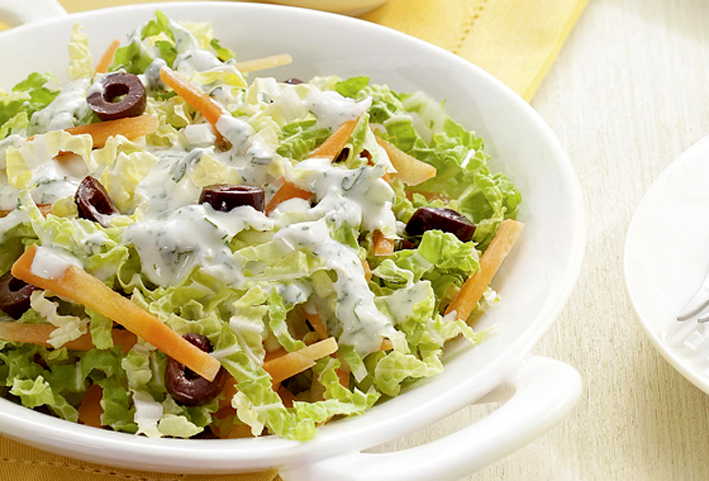 With a minty yogurt dressing and a generous amount of black olives, this chinese cabbage salad really stands out from the crowd. Serve it at a dinner party and listen to your guests rave about it. Place the cabbage in a large salad bowl, and toss the leaves to separate them. Sprinkle the grated or julienned carrot and the olives on top. Reserve, preferably in the refrigerator. In a medium mixing bowl, combine the yogurt, lime juice and honey and mix well with a fork. Add the mint and mix again. Season to taste with salt and pepper. Serve the salad with the dressing on the side so that diners can add to taste. The garlicky soy dressing adds a definite asian flavour to this napa cabbage chicken salad. 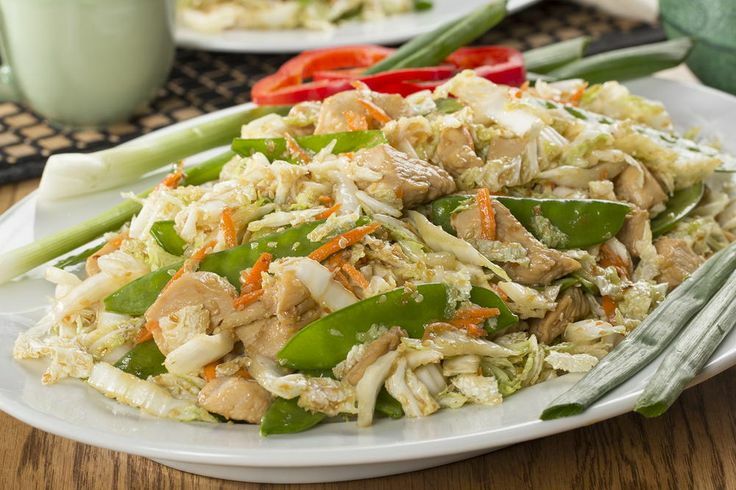 The combination of green snow peas, orange carrots and the white chinese cabbage create a very attractive looking and delicious salad. In a large skillet over medium heat, heat 2 tablespoons sesame oil; sauté chicken 5 to 7 minutes, or until no longer pink in center. Remove chicken to a plate. Heat remaining sesame oil, and saute sesame seeds and garlic 3 to 5 minutes, or until seeds are golden brown. Add soy sauce, vinegar, sugar, and vegetable oil; cook 1 minute. Stir in chicken and heat 3 minutes. In a large bowl, combine cabbage, snow peas, and carrot. Add dressing with chicken and toss until cabbage is evenly coated. Serve immediately. 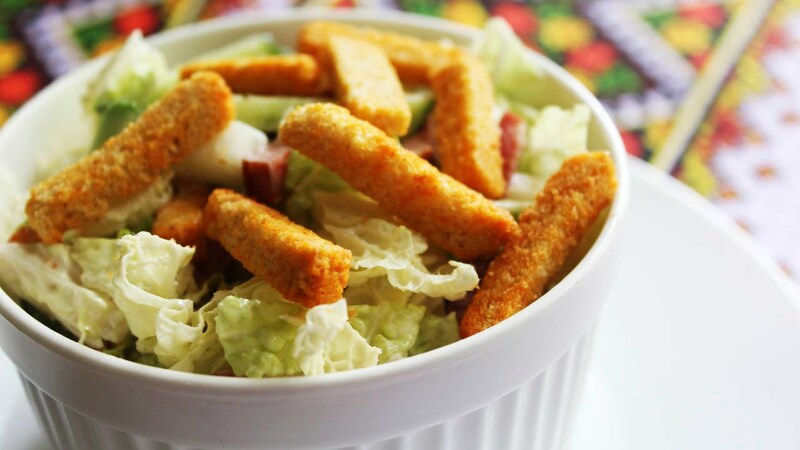 Serve the salad immediately after making it, before the crackers become soggy. You can substitute the crackers with other crunchy items like crispy noodles or wontons. Chop the napa cabbage and the cucumber into thin slices. Cut the sausage into long strips. Add all the salad ingredients together in a big bowl and toss together. Hello very cool site!! Guy .. Beautiful .. Amazing .. I’ll bookmark your web site and take the feeds additionally…I am satisfied to seek out a lot of helpful information right here within the submit, we need develop more strategies on this regard, thank you for sharing. Real nice style and design and superb content material, absolutely nothing else we need : D.
Hi my friend! I wish to say that this article is awesome, nice written and come with approximately all important infos. I¦d like to look extra posts like this .